Grandma and Grandpa J are watching the kids a few days of the week during the interim between school and their summer programs, so we went over to their house for dinner the other night and I brought home some spaghetti. I mixed it up before I packed it over a couple of lettuce leaves. 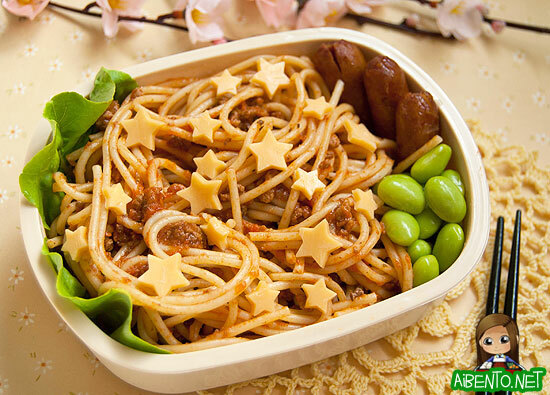 I’d bought a bento mook a while back from J-List and it came with little charaben cutters, including one with two small stars. 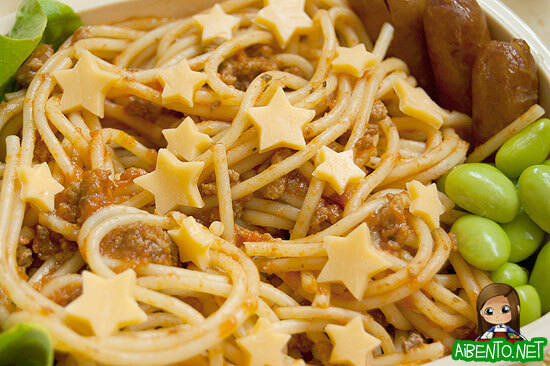 I used it to cut cheese to put on top of the noodles for a little “Twinkle Twinkle Little Star” look. I added some shelled edamame and three litl Smokies.